Ingolstadt-based automaker, Audi, has taken the wraps off the convertible version of the R8 V10 Plus. It is called the R8 Spyder V10 Plus and it is also the most powerful convertible that the company has ever rolled out of its production floor. Powering the R8 Spyder, is the same naturally-aspirated, 5.2-litre V10 engine that does duty in the coupe. It is tuned to produce 610PS of power and 560Nm of torque. The engine comes mated to a 7-speed, dual-clutch automatic transmission and the power is transmitted to the road via Audi’s quattro all-wheel-drive system. Fun Fact: The same engine also powers the Lamborghini Huracan range, albeit in different states of tune. When it comes to performance specs, the R8 Spyder V10 Plus doesn’t disappoint. Audi claims that it can hit 100kmph from a standstill in a mere 3.3 seconds, which is 0.1 seconds slower than the coupe but is 0.3 seconds faster than the R8 Spyder V10. The top speed is clocked at 328kmph and that’s 2kmph slower than the coupe but 10kmph faster than the R8 Spyder V10. The drop-top is made out of fabric and the substructure has been engineered using lightweight materials like aluminium and magnesium. The entire mechanism weighs just 44kg and complements the low weight and low center of gravity recipe of the R8 Spyder V10 Plus. The roof can be raised or dropped in 20 seconds. It can even be operated while driving at speeds up to 50kmph. Inside, the 12.3-inch Audi virtual cockpit immediately demands attention as it uses 3D graphics to display information. Audi also offers its MMI (Multi Media Interface) navigation plus with MMI touch with this two-seater drop-top. While it supports voice recognition, it even comes with microphones integrated in the seatbelts for better voice quality. The optional Audi connect module enables fast internet access via LTE. Its range of offerings include navigation with Google Earth and Google Street View. There is also support for Android Auto and Apple CarPlay for seamless smartphone connectivity. The infotainment system comes mated to a Bang & Olufsen sound system with two loudspeakers mounted on the head restraints of both the seat. Audi claims that you’ll be able to enjoy the music even with the top down. While Audi has started taking orders for the R8 Spyder V10 Plus in Germany, it won’t be long before Audi puts it on sale in India as well. The coupe in India is priced at Rs 2.55 crore (ex-showroom Delhi). 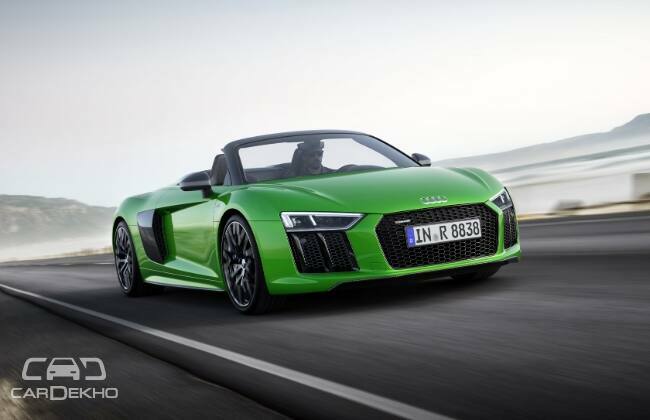 When Audi gives the Spyder the green signal for India, we expect it to cost around Rs 2.8 crore.